It’s long been the subject of online rumor, speculation and discussion and it became official this week – Canon has a compact system camera. It’s called the Canon EOS M and it’s more or less a compact, mirrorless version of the recently announced Canon EOS T4i / 650D digital SLR. 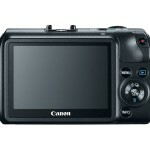 It uses the same 18-megapixel APS-C CMOS sensor with Canon’s new “Hybrid CMOS AF,” DIGIC 5 processing, and it has the same 3-inch touch screen LCD display, although it’s not an articulated display like the T4i / 650D has. Video specs are also the same as the T4i, with selectable frames rates and resolution, including 1080p full HD video at 30 FPS and 720p at 60 FPS. Canon also announced two new “EF-M” lenses and an EF-EOS M adapter to go with the new EOS M mirrorless camera – a 22mm f/2.0 prime that will be included in the initial kit, and an 18-55mm f/3.5-5.6 IS standard zoom. 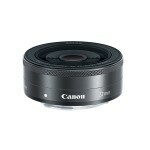 Both lenses use Canon’s new STM Stepping Motor technology, allowing silent, continuous auto focus in movie mode. 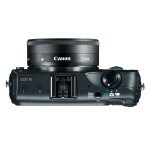 Looking at the design of the EOS M, it’s clear it was designed for point-and-shooters and not pros. External controls are limited with only one control dial, no built-in flash, and a non-standard mode dial that only shows three modes: Scene Intelligent Auto, Camera mode and video mode. The EOS M does have a full range of shooting modes; include aperture priority (Av), shutter priority (Tv), Program (P), full manual (M) as well as scene modes and Creative Filter in-camera processing modes. However, the specific shooting modes are all accessed via the touch screen LCD display (see video, below). Look at the camera photos at the bottom of the page and you’ll the EOS M is laid out a lot more like a point-and-shoot than a DSLR. There’s a Quick Control menu on the LCD, just like a Canon digital SLR, that can be accessed from the button in the middle of the four-way pad on the back. The Quick Control menu allows immediate touch screen access to all regularly used settings like shutter speed, aperture, ISO, white balance, auto focus, etc. I’m really used to Canon’s dedicated DSLR controls so I don’t quite know how I feel about the simplified, touch screen-driven controls. However, with the touch screen and Quick Control menu, I think the lack of dedicated controls may be just fine. And obviously, if you’re used to a point-and-shoot camera, they’re going to be great. 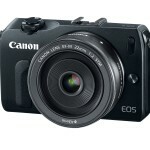 Since the EOS M is more or less a T4i / 650D without a mirror, general performance and image quality should be the same. The burst rate is a slower at 4.3 frames per second but the EOS M’s video features and specs appear identical, with a built-in stereo microphone with 64-level audio control and 1080p full HD MP4 video in the .MOV format at 30, 24 or 25 frames per second; and 720p at 60 or 50 FPS. There’s also a 3.5mm headphone input and HDMI port. The EOS M uses the same sensor as the T4i / 650D so it has Canon’s new Hybrid CMOS AF, which combines phase detect and contrast auto focus on the sensor for improved live view auto focus, including continuous auto focus in movie mode. With the EOS Full HD Movie mode, introduced with the T4i, offers full manual exposure control as well as Movie Servo AF for continuous auto focus and even subject tracking. Tracking a subject is as easy as touching them on the touch screen display and then letting the camera do the rest. You can also use Canon’s Picture Style settings, including your own Custom Picture Styles to fine-tune and customize the look of your movies, in-camera. Like I said, these features aren’t new. They’re all available in the T4i / 650D. But it’s a pretty powerful video feature set for a mirrorless camera clearly designed as an upgrade for casual point-and-shoot photographers. I’ve been a big fan of compact system cameras since Olympus put their first Pen camera in my hands. They’re an excellent compromise for travel and outdoor photography where camera size and weight make a difference. In fact, they’ve gotten good enough and I like them enough that, over the past couple of years, I’ve used mirrorless cameras more than digital SLRs for my own photography. In spite of all the rumors I had just about given up hope for a Canon mirrorless camera. 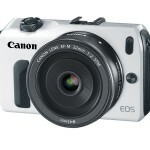 So the EOS M comes as very good news for this long-time Canon SLR shooter. However, I was a bit disappointed when I read that Canon decided to go with an APS-C sensor for the EOS M. I was hoping they would use the 1.5-inch 14.3-megapixel CMOS sensor from the G1 X as the foundation for a mirrorless system. 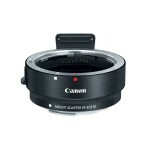 That sensor has excellent image quality and the smaller format would have allowed Canon to make their mirrorless camera and lenses smaller, which is the whole point of mirrorless cameras in my opinion. But a larger sensor will always deliver better image quality, so Canon’s decision to use the same 18-megapixel APS-C sensor they’re using in the T4i / 650D is perfectly understandable. 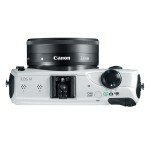 Each manufacturer is looking for an edge and Canon went with image quality. 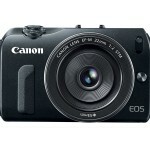 As it turns out, the EOS M is smaller than I expected. Canon managed to keep both the camera body and 18-55mm kit lens about the same size as the Olympus E-PL3 and 14-42mm kit lens (with the 2x Micro Four Thirds conversion factor, the two lenses effectively have the same focal length). But Canon’s 18-megapixel APS-C sensor produces much better image quality than the 12-megapixel Micro Four Thirds sensor in the current Olympus Pen cameras. There are only two Canon EF-M lenses now so it’s hard to judge how big future lenses will actually be. 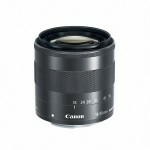 Hopefully Canon can keep future lenses small. Ultimately, it’s all about what compromise is more important to each photographer – sacrifice some image quality for a smaller camera; or pack a larger camera for better image quality. I would have preferred that Canon went with the smaller sensor – I think the G1 X image quality is excellent and I am happy to sacrifice a little image quality for a smaller, lighter mirrorless camera. But the 18-megapixel sensor will definitely have better image quality. And I need to actually use the EOS M before I get too judgmental about it. One last point – as I said at the beginning of this article, the Canon EOS M was obviously designed as an upgrade for point-and-shoot photographers. Other than the fact that it’s smaller and lighter than a digital SLR, it’s not going to appeal to more experience photographers and pros. I’m sure it’s already in the works but Canon needs a second model to appeal to more experienced photographers. I’d like to see a built-in electronic viewfinder, flash and faster burst rate. And some new lenses, of course. The biennial Photokina tradeshow takes place in Germany this fall. That’s the biggest camera tradeshow on the planet so camera companies usually do their biggest announcements there. Hopefully Canon will have a new mirrorless camera for the pros at that show. The new Canon EOS M compact system camera is scheduled to be in stores this October for US $799 in a kit with the EF-M 22mm f/2 STM pancake lens. The EF-M 18-55mm f/3.5-5.6 IS STM zoom lens and Mount Adapter EF-EOS M for standard EOS lenses should also be available in October for $299 and $199, respectively. 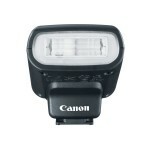 Since the EOS M doesn’t have a flash, Canon is also introducing a new compact hot shoe flash, the Speedlite 90EX. It will sell for about $150. I’ve been thinking about the EOS M some more. I was on the fence about the new T4i / 650D. I wanted to buy one to replace my old XSi – mostly for studio work and video. 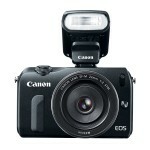 And since the EOS M has most of the same features, it would have been a great, compact alternative. One of the features I really want from the T4i, the tilt-swivel LCD, is missing. The tilt-swivel LCD is such a huge benefit in the studio and any other time you’re working on a tripod. 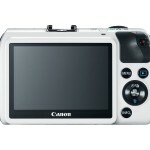 Maybe the second Canon mirrorless camera will have that feature? I am now a 30D user, so I consider this more than a ‘point and shoot’ upgrade. The T4i woujld serve my needs well but this is so much smaller and has the same capabilities. A viewfinder and swivel LCD would be incredible but at half the weight, this may be a reasonable compromise. The next-generation of the 60D will surely be bigger the the T4i and may be priced closer to the 7D range than the 60D. Definitely like the fact the camera can exchange lenses with EOS. Instead of having a line of different lenses if you have an EOS before and kept your lenses you don’t have to buy a whole outfit again. The only 1 disadvantage is the flash. For a few years have learn to live with the convenience of not having to carry a dedicated flash that many wedding photographers still use. For P&S especially you want a small box with everything built-in. An external flash may be small enough in your pocket but can be dropped or lost easily on vacation. Otherwise quality means everything. Have to see the sample shot enlargements to make the final decision.